Middle East Quartet envoy and former UK PM Tony Blair says he believes it is possible for a peace deal to be reached between the Israelis and Palestinians. But he sounded a note of caution about how early it might be achieved with a warning that much remained to be done. 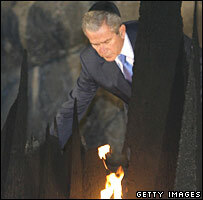 Mr Blair spoke after meeting US President George W Bush in Jerusalem. Mr Bush wrapped up his landmark tour by visiting a Holocaust museum, a day after he urged Israel to stop occupying some Palestinian territory. He also suggested a solution to the issue of Palestinian refugees that would involve paying them compensation. It was thought to be Mr Bush's strongest public statement pressing Israel to give up land it seized in the 1967 war. Wearing a black skullcap, Mr Bush was joined by Israeli Prime Minister Ehud Olmert and President Shimon Peres on a Friday morning visit to the Yad Vashem Holocaust museum in Jerusalem. His three-day visit was part of his attempts to seal a peace agreement between Israeli and Palestinian leaders before he leaves office in 2009. He will fly to Kuwait next on the first leg of a tour of Gulf Arab states aimed at gaining support for his peacemaking efforts and policy on Iran. 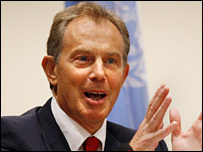 In a television interview following his meeting with Mr Bush, Mr Blair said he was "cautiously optimistic" that a peace deal was achievable by January 2009, when the president leaves office. "Sure, it is absolutely possible to have a peace deal by the end of the year if people want to make it happen," he said. But he warned that to achieve this, those involved had to be prepared "to have the courage to take the difficult decisions to make the difficult compromises". "I think given the determination there is to succeed and given the desire on the part of the American leadership, the Israeli leadership, the Palestinian leadership to see it happen, I think people could be surprised this year," he said. The former UK prime minister said there was "no option" but to have both a state of Israel and a Palestinian state "living side by side". He added that in the longer-term, most "sensible Israelis" knew the only real solution to security problems was a peace deal with the Palestinians. "There is no alternative but to push forward and to do so with determination." The BBC's Matthew Price in Jerusalem says Mr Blair has spent much of the last few months on the ground here in the Middle East trying to work out how to help the Palestinians build better institutions. If he can do that, the hope is that he will manage to lay the foundations for a Palestinian state, our correspondent says. After holding separate talks with Israeli and Palestinian leaders, Mr Bush told a news conference on Thursday that there should be "an end to the occupation that began in 1967". "Agreement must establish Palestine as a homeland for the Palestinian people just as Israel is a homeland for the Jewish people," he said. Mr Bush said this would require secure recognised and defensible borders for Israel, and a viable, contiguous, sovereign and independent Palestinian state. But he stressed that Israel would not have to withdraw from all occupied land and that mutually agreed adjustments to the 1967 borders would be necessary "to reflect current realities" - a reference to Israeli settlements. The president also said called for Palestinian refugees to be compensated, rather than being allowed to return to their former homes in what is now Israel. He also warned both sides not to do anything to break the promises they have already made, and which might make negotiations more difficult. "On the Israeli side, that includes ending settlement expansion and removing unauthorised outposts," he said. "On the Palestinian side, that includes confronting terrorists and dismantling terrorist infrastructure."